I’ve been working with children for over 20 years and play dough is the fail safe way to engage and excite little hands and minds! 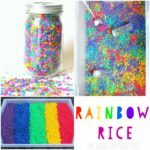 It is a brilliant sensory and fine motor tool that is ridiculously easy to make and SO much better than any store bought versions. By making it yourself you know exactly what has gone into it and can also customise it in so many ways, such as adding colour, sparkles and even natural flavours or essential oils. 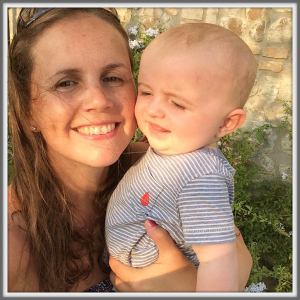 It has a proven therapeutic quality and has saved my parenting on more occasions than I can number! It is, quite simply, the best play material out there. 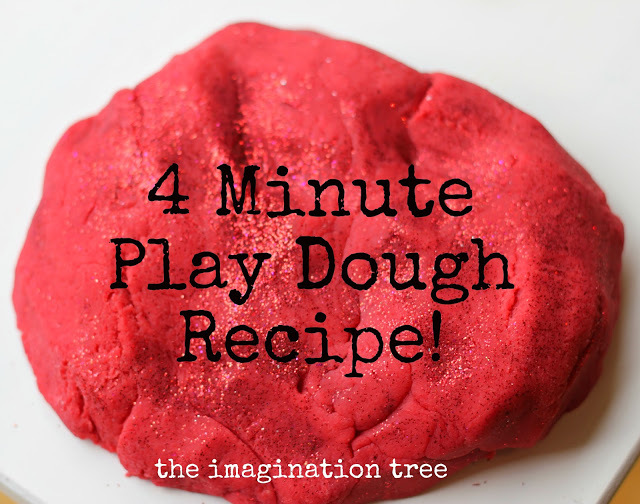 I hope you will love my easiest ever, no-cook play dough recipe! The benefits of using play dough for young children are wonderful and the play possibilities are endless! We use these Wilton Gel colours as they are much more vibrant and take only a tiny amount to colour the dough. We also use them in all our other sensory play activities to and they last for ever! Here’s our new video showing how EASY it is to make this play dough!! Once you’ve made your play dough hop on over to this post where I explain the totally amazing benefits of play dough play! And recommend many items to start collecting to create a play dough tool kit. 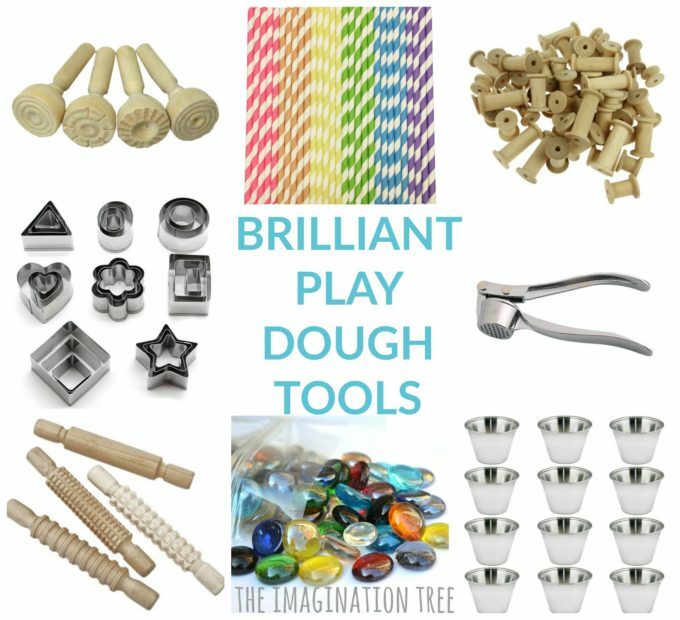 Here are some brilliant play dough tools we have and love to use alongside this recipe. These are totally worth adding to your play dough toolbox and will last for a very long time! 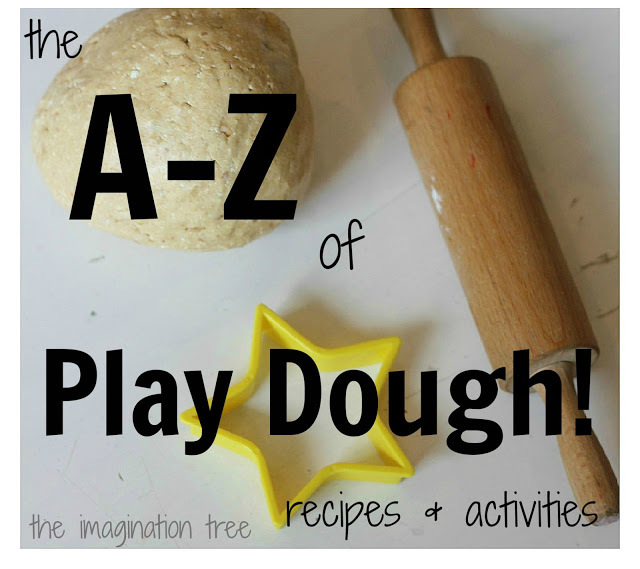 Plus many more ideas in individual posts in my play dough archives! 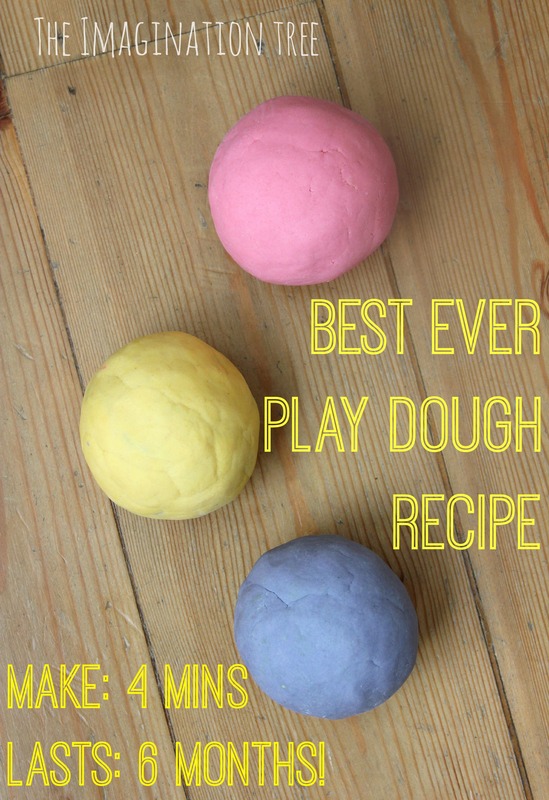 How here are over 50+ ways to change this basic mix to create an amazing range of different play dough flavours and fun activities to go with them! Literacy, maths, imaginative play and role play to name just a few. Click through to find your favourites and pin them for future use. 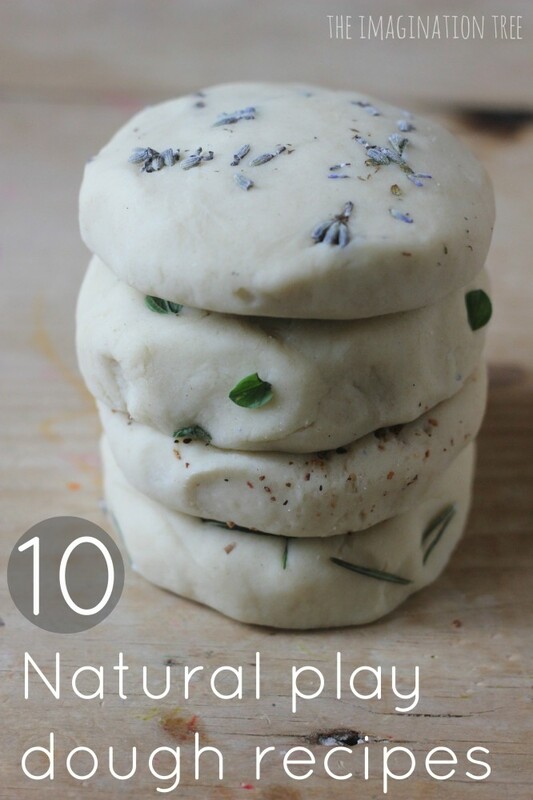 And here are 10 beautiful, natural play dough recipes for you to try too! « Shoe Shop Dramatic Play! Ohhhh FAB – we need more playdough ours got used! yesterday. Thank you for this website.I find it inspirational. For the lazy, could this be made in the food processor? Hehe I’m not sure but you could try! It really doesn’t take long anyway! I makeit in the food processor all the time! Instead of food coloring we add 1 package of kool aid. Works great. Have used a no-cook recipe much like this for my class of reception children, and it usually lasts fairly well for more than four weeks, through some quite boisterous and sustained use! Have never added glycerine – will try this sometime! Love all your variations, too. Can’t wait to try some of them after maternity leave! I’m going to try this recipe with my kids. I have a Kool-Aid playdough recipe that I use all the time because you never have to use extra flour to get the sticky out of it. It turns out perfect every time. It uses the Kool-Aid drink powder packets for the coloring and they give it a nice smell too! This is how we make ours – minus the glycerine! Except, I put the food coloring in the water. Maryanne I tried your food colouring in water tip the other day and it’s brilliant! Thank you! Sorry Set Jay! Hard to describe, looks just like Bicarb of Soda or Baking Powder and is found in same section with baking goods in supermarket. Does that help? Ok thank you girls, i will try with lemon juice, we’ll see ! I think it should be ‘levure’, either the dry variety (not sure where you can find it, I think I never did) or the soft one, which can be found in ‘boulangerie’ or, when I’m lucky I find it in Auchan, in the cold fridge where they display their own cookies and deserts. levure is yeast – please don’t use that! taken from the blog above! Just a suggestion re: sticky playdough – try adding a little more oil. It seems counter-intuitive, but it works! That looks great! I’ve not yet made play-dough as my little boy is too young still! But he is gluten and wheat intolerant, so I was wondering if anyone had made it with gluten free flour at all? I don’t know if it needs the gluten to work or anything? We made GF play dough today. 1/2c GF flour, 1/2 cornstarch, 1/3 c salt, 2tsp cream of tartar, 2 tsp veg oil, 1c water. It will be stickier so knead well w GF flour on the counter. You’ll need quite a bit more. Just keep kneading it in and it worlds great! Made this today and it worked a treat! I used gel food colouring which was hard to mix in (I had to use my hands so they’re now bright red!) but gave the dough a brilliant colour. Heat the gel color with the water to thoroughly dissolve it first, then it’ll incorporate with no problem. this is still really sticky for me…even after adding loads of salt…any suggestions? I had the same problem when I made it today. You can just keep adding flour until it stops being sticky. I ended up adding another cup and a half. Next time I will put just one cup of water in first and add more if it needs it. Strange! Did you knead it for long enough? It’s definitely sticky for the first 2-3 minutes of real kneading, then it gradually gets smooth and dry. try adding a little more oil. I just made this for my 14-month-old. Thanks for the recipe–it worked perfectly! She’s going to be thrilled when she gets up from her nap. Thanks for sharing! I just made this… And will add the colouring to the water next time as I spent ages mixing in the colour. Doesn’t help that I wanted BLACK play dough… I ended up using most of the bottle! The recipe worked perfectly, and it is SO soft! My boys have been playing with it for half an hour or so, we’ll see how well it stands up to their prodding! haha, yes black is a nightmare! adding the colour to the water works really well doesn’t it! Thank you! I didn’t remember to start with just a little water, so had to add lots more flour as a I kneaded, but was able to get it to an absolutely perfectly beautiful consistency – nothing like the last recipe I tried years ago. We used turmeric for bright yellow (added lavender and sweet orange essential oils to mask that Turmeric Smell!) and chlorophyll for green. Lovely!! wonderful ideas of things to add! thank you for all your fun ideas. i made this today and it was a hit. we hammered golf tees into it. i put in a rubbermade container but i was wondering where would be the best place to store it. fridge? cupboard? I keep mine like that in the cupboard. If it’s humid where you are then probably try the fridge? Thank you, Anna! I had my 3’s help me make it today and I blogged about it today. 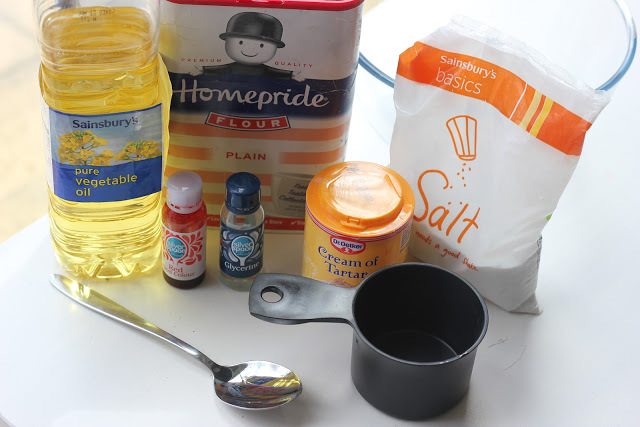 I’m about to try this recipe – I had never heard of adding glycerine, but it sounds brilliant! I just stumbled over here while my 4-yo and I were looking at playdough pins on pinterest while waiting for our groceries to arrive. Just made this with my 2 year old. He was getting impatient so we didn’t let it cool for very long. I was kneading and kneading and it was a horrible, sticky mess, and just seemed to be getting stickier and stickier with more flour and more kneading. I walked away in frustration and came back to it about 10 mins later and the consistency was much better! So I think another very important factor is to let it cool enough before you start kneading!! oh dear! but glad you sorted it out. Has never been sticky for us after kneading. Curious how it’s different for some people! We just made a very light pink to start and Im listening to everyones advice and walking away while it cools. I can tell I am going to be doing this often, as it was not much work. I diluted the food coloring into a tad of hot water and added it in with the remaining water. Thank you! I hope to send some of this batch home with my sons therapist and the written recipe. Thank you for all your hard work sharing your incredibly creative ideas! thank you! hope it worked! I’m planning to make this to use with my two-year-olds at work this week. I was curious, though. Is there a way to do it without the boiling water? I’d like to let them help make it on the spot, but we don’t really have a way to get boiling water in the classroom, so I was curious if there were other options. Thanks for sharing! I think you could try warm water and see what happens! I’m sure it would still work? Sounds good :-). I’ll let you know how that works! Wow, fabulous. That took 10 minutes and now my son is sitting next to me stuffing all of his trucks in the playdough to see what impression they make. It’s soft, warm, not oily, and really such a lovely texture. Thank you once again for sharing all your hard work! How much does this make? I have 22 students. Is this enough for one kid? Would I have to make this 22 times for each student to have his/her own? Thanks! I’d say that one batch per 4 or 5 students would probably be reasonable. I generally make only a quarter of the recipe with my daughter, and it’s quite enough to have fun with. So… about five or six times the basic recipe? The recipe is fantastic, especially as we do not have a stove to cook on at our kindergarten,. The Willy Wonka colours are delicious! Thankyou! Thank you for the recipy! I added 3 Blueberry Bliss Tea bags to the boiling water, instead of food coloring – It came out a lovely pinky/purple and smells devine! We made this today and it was great! It was especially nice since it was 96 degrees, so no stove made me happy lol. Thanks! Does this play dough get moldy at all? Looks like fun! Made it yesterday with my three-year old and an extra batch for a birthday party. Thanks for sharing! Does your hands get stained from the food coloring? Hello, thanks for sharing this recipe, I finally made it today… first thing the little one did was put a big lump in his mouth! Thank goodness it is edible 🙂 I also didn’t use glycerine as it is hard to find here in Italy, and I used espresso cups for the measurements to make a smaller amount as the cream of tarter only comes in tiny 8g packets! but it worked a treat! Can’t wait to make more with different flavours and aromas. how big is a cup?? ?is it a measuring cup? Yes a measuring cup, about 250 ml. How much Play dough does this make? Making it for a group of 6- should I double it? Thank you! I tried the cook method for my last batch and it was pretty labor intensive. I just tried this one in the kitchen aid with a dough hook and it is the best play dough ever, just like you said! No more stained hands or super tired arms from stirring in a pot. Thank you thank you thank you! I always double my recipe and 2 cups of water vs 4 cups flour was plenty!! Love this!! I made green with thyme….red with cinnamon….blue with rain cent…..and black with pepper! Thank you for the inspiration!! I am going to make this as my demo speech, do you have to use cream of tartar? Fantastic, we just made it. My son loved helping me with the measuring and fixing. Thank you. Would powdered tempra work in place of food coloring? Ou maybe liquid watercolors? I love this playdough. My son has been playing with the same batch for almost a month and it still feels great. I’m currently making six batches so that I can give out playdough as party favors this week. I love this playdough! My first two batches were perfect. I made the cinnamon cookie dough and made a red dough with peppermint oil for “candy cane playdough”. I also added red glitter to it and will be giving batches out for Christmas! My third batch turned out super sticky and I can’t figure out why. I had to add a lot of flour and a bit of oil to fix it. The only thing i did differently was adding the spices (cinnamon, ginger, nutmeg and cloves) to the flour before I added the water. Also the water may not have been quite boiling anymore as I turned the stove off and finished mixing before I used the water. I salvaged it though and all is good! I LOVE this recipe. I like to heat the water, salt, and food coloring together first in the microwave, then add the rest of the ingredients. I generally only have kosher salt on hand and this dissolves the salt thoroughly so the dough isn’t gritty. Love this recipe! I’ve made 2 batches of this today for my children. 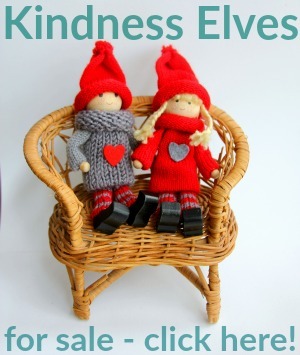 I also used peppermint oil to scent & added loads of glitter – the children love it! How much food colouring did you put in to make it that red? I put in half a bottle and it still turned out pink! Made this yesterday with my two year old. He loved it! Was sitting there sticking coloured sticks in it for ages (he was putting candles on a birthday cake apparently). I discovered your webpage a few days to it and I’m addicted! I love this recipe. I made it this morning for my half-daycare tots and they couldn’t get enough of it. Thank you! It worked from first try! 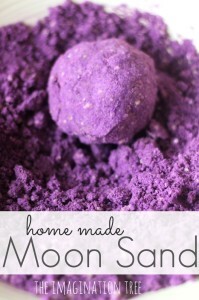 I divided what I got from this recipe into 6 parts and added 3-4 drops of dye to each piece. It gave nice rich colors. I used to do this when my children were little. It is much better than the store bought. This looks like a much better recipe than my old one. It’s a good tool to teach numbers and letters. Roll into a thin “worm” and shape. I made one batch and colored it with orange Kool-aid. It turned out more peachy colored than orange but it smells kind of orangey! This makes such a big batch that I think next time I’ll be prepared to split it into fourths before I color it. Thanks so much for the great recipe! Thanks for sharing all your ideas. I have never try to make play dough, but do you know a substitute for the cream of tartar? we don’t have that in Spain, is it a very important ingredient or can I just take it out? As a busy mom i’ve really wanted this recipe to work, but we’ve made it twice now with no success :/ I’ve tried adding more flour (LOTS more flour) but it’s still too gooey and sticky. Glad it’s been a success for most others though! Excited to try this. I also checked out your mega-play dough comprehensive post. What I am wondering is what are the pros and cons of cooked vs raw vs salt. I’ve heard salt is a germ killing agent. Is the raw one popular just because it is quicker? Any intel greatly appreciated. signed the person who can’t believe she used intel when talking about arts materials for toddlers. your blog. I too am an aspiring blog writer but I’m still new to the whole thing. Do you have any points for beginner blog writers? I’d definitely appreciate it. This was great. My girls are ten years apart and had not thought of doing this yet with youngest. Both girls had a ball. Peanut butter playdough next. I added only 1 cup of water, kneaded for about 10 minutes and it was still very sticky. I ended up adding about a cup and a half of extra flour, little by little. Worked like a charm. My preschool class loved it! Thanks!! How long does it last? Should I keep it refrigerated? Will this recipe for play dough bake hard if you need it to? My son needs some for a school project where he needs to make a model and then have it harden. I wasn’t sure if the oil would inhibit it from hardening. This is amazing! its so simple and came out perfect.. I didnt have cream of tarter so i left it out. it still came out feeling and molding the same way play dough does! thank you for sharing this! Thank you, thank you, thank you! 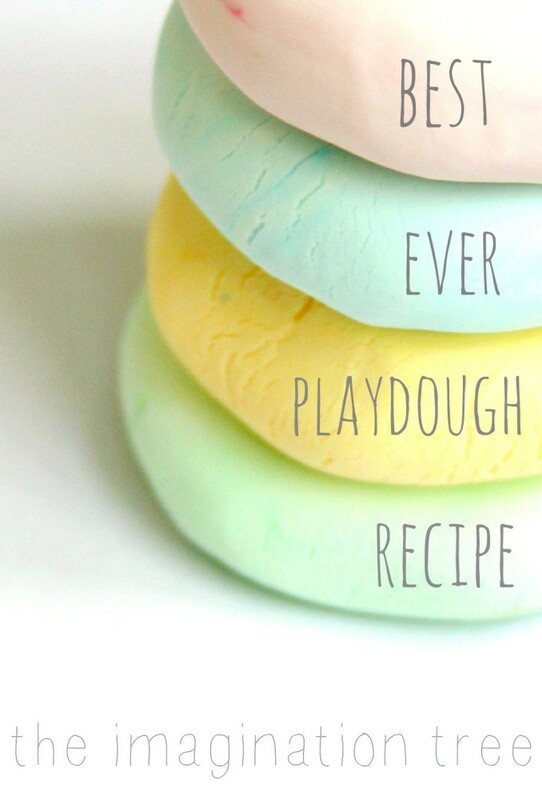 This has become my go-to recipe for playdough. My daughter just loves it. We’ve made a whole variety of colors (no scents yet because she sometimes still eats it). This week, we left it white and are going to make all sorts of winter goodies: snowmen, sugar cookies, etc. Thanks again! Why has noone asked if you can bake this saltdough recipe??? 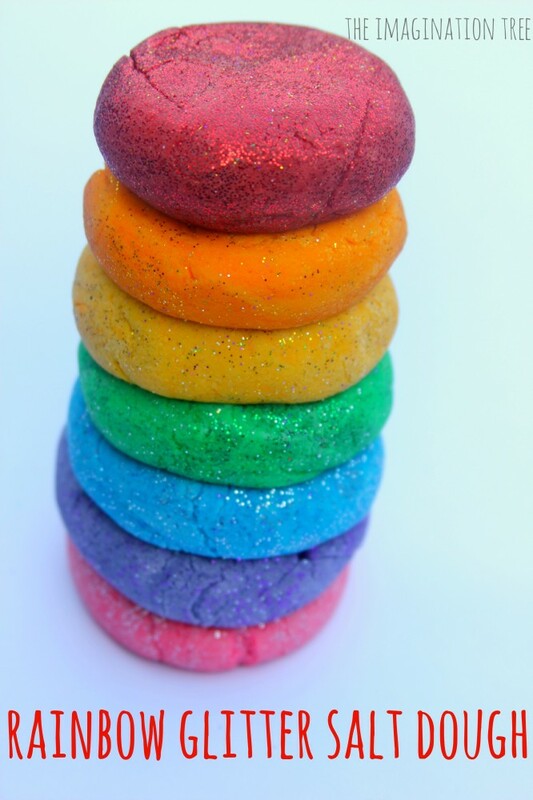 Need to make saltdough rainbows with a class but we have preciously baked them hard after and varnished them so they last. Never used the glycerine recipe but would love to if anyone thinks this one is a bakeable one (long time on a cool oven obviously!) Any thoughts? I’ve been making playdough for my preschool class for years so loved trying this because of the boiling water. I use baby oil in place of the oil and it makes it smell good and also adds a bit of shine instead of adding the glycerine. Thanks for sharing!